Cut the aubergines into thick wedges. Heat some coconut oil in a large pan and brown the aubergines for 2-3 mins on each side until golden brown and crisp all over. Do this in batches until all the aubergine is done. Remove and place to one side. Add some more oil to the pan if necessary and then throw in the mustard seeds and curry/bay leaves and fry for 30 seconds until fragrant. Stir in the onions and continue cooking until they are softened and beginning to brown. Add the dried chillies and spices with a few tablespoons of coconut milk then fry for 1 more minute. Add the remaining coconut milk, tomatoes and tomato puree. Simmer for 25-30 minutes until thick. Add the creamed coconut now if you are using it. 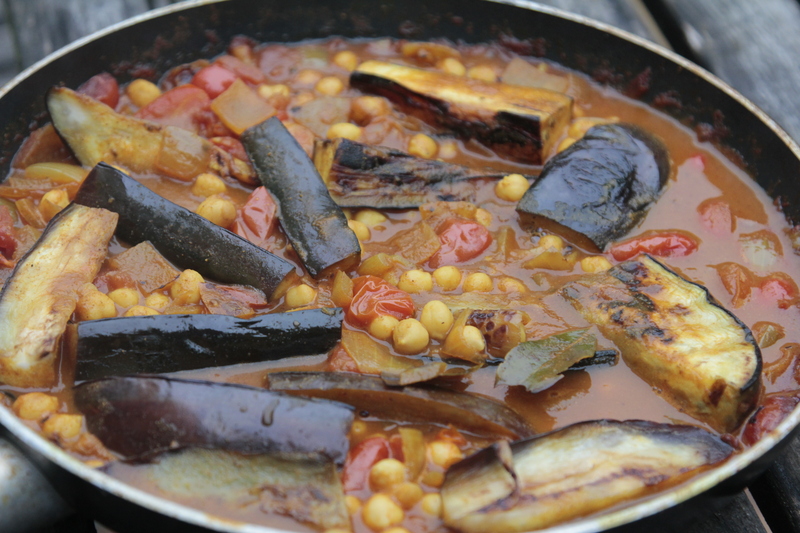 Stir in the chickpeas and aubergines. Continue simmering for 5 minutes or so, until everything is hot and the aubergines are tender. Serve with a dollop of natural yoghurt, you could also serve with quinoa on the side.